Ship losses at sea, though still at an unacceptably high level today, were even more frequent in the days before radio, radar, echo-sounders and others aids to navigation. Loss of life in such incidents was very high, since before the advent of air travel all overseas passenger travel was by ship. In the age of sail the most passenger ships were small – well under 200 ft long and 1500 tons – not because large sail-driven ships could not be built, but because of the requirement for very large crews. Despite such vessel sizes, and when sailing technology was mature, as in the 19th Century, huge numbers of passengers were carried. It is hard to imagine today the degree of overcrowding, discomfort, poor sanitation and lack of privacy which was involved, especially on long voyages. The hazards of the sea included not only adverse weather – with its attendant sea-sickness – but, most dreaded of all, fire. These separate factors came together very dramatically in 1825 in the case of the Kent, and the incident aroused such interest that even decades later it was to be immortalised in poetry – of which more anon. The Kent was a typical representative of the fleet of ships – “East Indiamen” – operated by Britain’s East India Company for trade between Europe, India and China. The Suez Canal had not been constructed in this era (it was to open in 1869) and the voyages involved were as a consequences considerably longer than they would be today. Launched in 1820, the Kent was 133 ft. long overall and was of 1330 tons burden. Her crew was some 140 – an indication of just how many men were required to operate a sailing vessel of this size. One can see how attractive steam propulsion was to be in due course because of the reduction in crew requirements. It should be noted that this figure of 140 applied before a single passenger came on board. The years 1821 to 1824 were occupied by the Kent in two successful trading voyages to China. These were of long duration – on the first the Kent left England in March 14th 1821 and reached the Whampoa anchorage (between Canton and Macau) on September 24th, having had intermediate stops at Bombay and Singapore. It was on the Kent’s third voyage, in 1825, that disaster struck. Sailing as before under Captain Henry Cobb, she was now contracted to carry troops, and their families, to India. These belonged to the 31st (Huntingtonshire) Regiment of Foot, originally formed in 1702. In addition to her own 148-man crew the Kent set out from England with 20 officers and 344 soldiers of the regiment, 43 women and 66 children accompanying the, and 20 private passengers. With a voyage of some three months ahead of her the Kent was carrying a total of 641 persons within her 133 ft. length. Cows or goats were also likely to have been carried to provide fresh milk. The conditions must have been insufferable by modern standards, even though they were considered normal at the time. The Kent sailed from Gravesend in mid-February and on March 1st was encountering heavy weather in the Bay of Biscay. Choosing what appears to have been an inopportune moment for such an activity, one of the ship’s officers engaged in checking the spirits in the hold. A sudden lurch by the ship knocked his lantern from his hand at the same time as a loose cask burst open. The spirits took light and the fire spread so rapidly that abandoning ship must now be considered. Now another hazard of the era presented itself – no vessel of the period carried sufficient lifeboats, a situation that was only finally to be resolved almost a century later after the loss of the Titanic. The situation was at its most hopeless when fate intervened.A small 200-ton brigantine, the Cambria, commanded by a Captain Cook, happened to be in the vicinity and sighted the Kent’s distress signal. She carried a crew of 11 men and some 20 Cornish miners, all of whom threw themselves wholeheartedly into rescue efforts, disregarding the fact that the Kent’s powder magazine might explode at any moment. The soldiers behaved equally admirably, some tying children to their backs and swimming with them to safety. The Kent’s crew appears to have behaved less well. Some, having got away by boat, refused to return for their shipmates. Only the threat by the Cambria’s captain not to take them on board induced them to change their minds. By the evening, the Cambria had taken some 550 survivors aboard – it must have been a case of “standing room only”. Another vessel, the Caroline, now also arrived and managed to take off 14 survivors. In the early hours of the following morning the Kent exploded her, the shock apparently encouraging a soldier’s wife, now safe on the Cambria, to give birth. Both the Cambria and the Caroline now turned for England, where the survivors were landed safely. Despite the heroic rescue efforts the loss of life was still high – 81 in total, of whom 54 were soldiers and 20 children. It is pleasing to note that the miners and others associated with the rescue received silver medals in recognition of their courage. The Kent disaster was probably made more newsworthy at the time by the providential rescue. Several artists painted their own versions of the event. Those by William Daniell and Thomas Marie Madawaska Hemy are quite horrific as they depict transfer of personnel between the burning Kent and already-laden boats. The loss of the Kent was to be immortalised several decades later by the famous and prolific Scots poet, William McGonnagal (1825-1902). It was indeed through perusal of the McGonnagal anthology “Poetic Gems” that I first learned of the incident. The poem, a delight for all lovers of the English language, is too long to reproduce in full but the following verses hint at its flavour and its quality. Should the reader want more – or indeed be interested in learning about numerous other 19th Century disasters, battles or public events described by McGonnagal in heroic verse, I can heartily recommend his “Poetic Gems”. If you’re interested in receiving a free copy of this story – and of another Dawlish Chronicles short story, Britannia’s Eventide – click on the image to the right to join the mailing list and to receive your electronic copies. 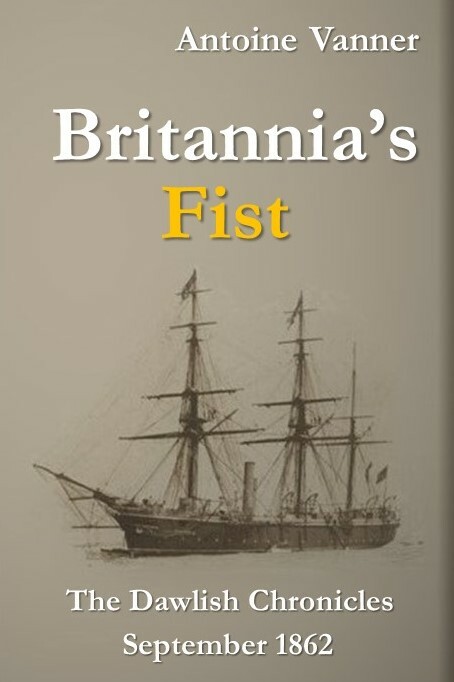 If you are already on the mailing list a copy of Britannia’s Fist has already been sent to you. We’ve met Nicholas Dawlish in his thirties in the five novels published so far, and in Britannia’s Eye, the bonus short-story attached to Britannia’s Amazon, we’ve learned more about the family background that brought him into the Navy. In the opening of Britannia’s Spartan, we saw him face action for the first time at the age of fourteen while in the free short story Britannia’s Eventide, we caught a glimpse of him the retirement he will be so unexpectedly plucked from in 1914. And now, in Britannia’s Fist, we get a further snapshot, one that shows him at a critical moment in his development as a man and as a leader. (Click here for an outline of his life).